Bayern München vs Hoffenheim fired into life at the Allianz Arena with the away side notching two goals inside the first 12 minutes. What followed was a Hoffenheim collapse as big as their start, leaking two goals in quick succession to der Rekordmeister they allowed Bayern back into the game – the champions eventually running away as 5:2 winners. There were still people taking their seats and making their way back from the bar when this fixture fired into life. 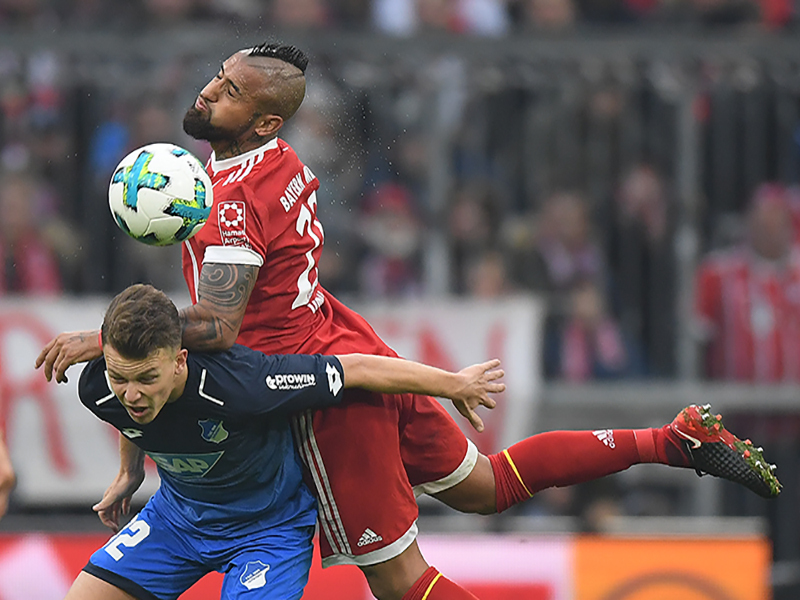 With just 90 seconds on the clock Serge Gnabry was fouled by Joshua Kimmich, the foul looked to be committed on the edge of the area but the referee pointed to the spot – Penalty Hoffenheim. Gnabry picked himself up to take the spot-kick, Ulreich was down quickly to make the save but the Bayern ‘keeper pushed the ball back into the danger area and Uth smashed the ball home. If the Allianz was in shock then it was a precursor for what was about to follow. Hoffenheim bullied and pressed the Champions, the ball broke to Ganbry just outside the area on the 12th minute – this time the loanee wasn’t to miss, his shot hit the roof of the net and the visitors were in dreamland. 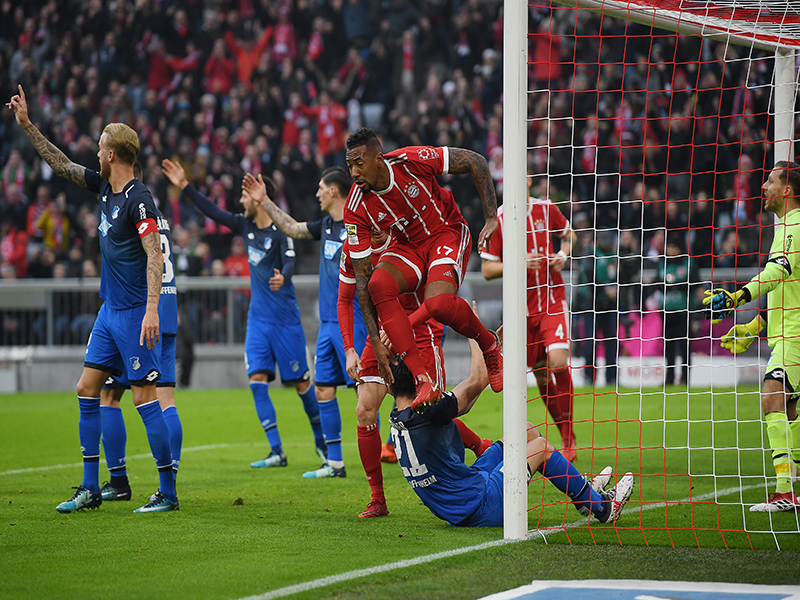 The Bayern players looked as shocked as their supporters in the stands – however, the second goal kicked the Champions into life and what followed was typical die Bayern. As a unit they instantly came together – Robben, Alaba, Vidal and Lewandowski at the front of the charge. The Polish striker poked the ball home from a matter of inches to start the comeback. Pouncing after a shot by Kimmich, the 29-year-old was wide awake in the box and Bayern had their lifeline. Minutes later the hosts were level, Boateng getting on the end of a Robben corner to pull the score level as quickly as it got away from them. As the half drew to a close it was the Champions who looked the more likely to score, the visitors were pleased to hear whistle the when it came. If the first half started fast, then the second 45 minutes didn’t disappoint. Uth found space inside the Bayern penalty area with the half only seconds old. Miscontrolling the ball as he tried to turn away from his marker, the striker spurned an early chance to stun Bayern again. With that the game began to swing towards the hosts, first Robben cut inside and unleashed a trademark shot which was blocked at the last before Vidal tried his luck with a sumptuous volley from the edge of the area. 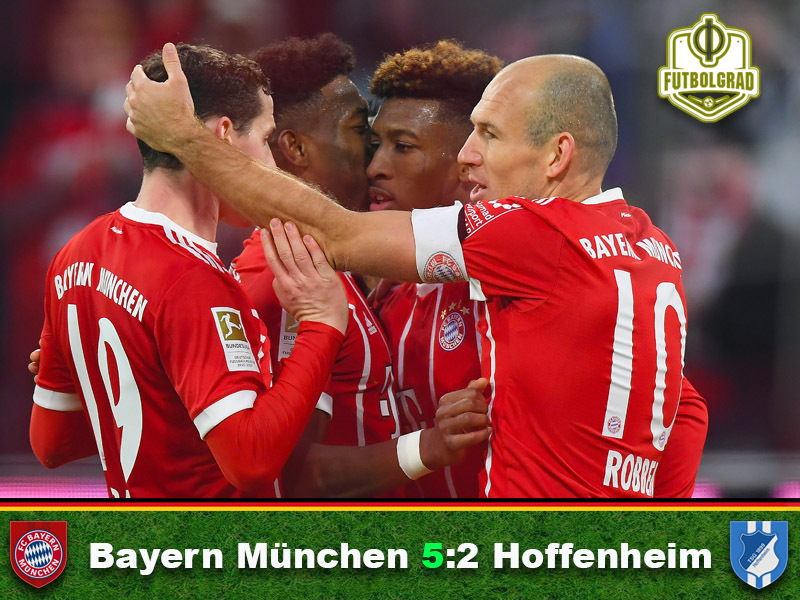 Bayern began to dictate the tempo but Hoffenheim refused to roll over. In search of his third goal against Bayern in as many games, Mark Uth carved out an opportunity from range but his shot was charged down by Boateng and the chance zipped past Ulreich’s post. Just as the visitors looked to be peaking Bayern hit them on the break. Lewandowski fed Coman with a delightful ball and the Frenchman drilled the ball under Baumann from the edge of the box. It was a fantastic passage of play that resulted in the winger skipping past Vogt if he wasn’t there. Moments later and it was four – Vidal turning a Robben cross into the goal – originally scrambled clear, it was soon awarded by the referee after receiving word that the ball had crossed the line. If Hoffenheim had originally stunned the hosts the tables had been well and truly turned. Just to add insult to injury, Sandro Wagner came off the bench to hit a 90th-minute goal against his former team. Rocked in the early moments, Arturo Vidal quickly recovered to not only patrol the midfield but also add a crucial fourth goal. The Chilean was relentless in his pursuit of the ball, bullying Grillitsch and Lukas Rupp he soon began to pull the strings, feeding the ball left and right to Bayern’s dangerous wide men. A constant threat from attacking set pieces as well as resolute in defending them – it was a brilliant display from Bayern’s number 23. As quickly as they looked rocked the champions stormed back into this fixture. Leaking two goals in 12 minutes they only needed the same amount of time to level the score. Quickly extinguishing any fightback from their visitors they hammered home two goals in three second-half minutes to once again hit multiple goals in a match. If there looked to be a chink in their armour it was rapidly welded up as Bayern passed the ball around with the air of impending champions. The Sinsheimers lose to Bayern under Nagelsmann for the first time. Bayern needed just three second half minutes to double their first half goal tally. The Rekordmeister’s lead is restored at the top of the table to 16 points.